UPDATE: Patch 3.1.5.1 has now been released which fixes the issue. Have you installed patch 3.1.5 and now find your Starcraft 2 install is crashing a few seconds after logging in? Well you’re not alone. A thread on the Blizzard forums shows a long list of people experiencing the same thing. So hunker down for a further patch – hopefully it hits soon. We at least know that Blizzard have acknowledged the issue. If you’ve found a workaround, post it in comments. Suggesting that the PC version is used is not a workaround. Starcraft 2 South East Asia Region: Casual Player Graveyard? I’m getting a little frustrated with my Starcraft playing experience. I’ve been playing on the South East Asia the past couple of years, and have noticed it’s harder and harder to get a ranked match or versus AI game via the Matchmaking option. Then, over the past three months, I’ve been unable to get a single match pop for me. A couple of times I’ve left matchmaking running and gotten involved in doing something else, come back to my computer and seen search times of 100 minutes plus. Sure, I’m not in a clan, but surely it’s not that unusual for a casual player to be after some games via the Matchmaking interface? I looked at transferring regions, but all progress and achieves are lost. Would love SEA region players to comment: why the lack of activity? The “Damaged Units Only” status bar option now applies only to life, shields, and energy. All other status bars behave as if “Always” is selected. Custom observer interface files are now read from the “My Documents/StarCraft II/Interfaces” location rather than account specific locations. The Idle Worker button now plays a subtle glow animation while active. The Regions button on the Login Screen is now visible at the password entry step. Upon selecting a region, players will be logged out to account entry with the proper region selected. A confirmation dialog now displays for players attempting to login to regions running a newer version of StarCraft II than their current version, rather than automatically closing the game client and patching up to the newest version. Recover Game UI no longer shows any events after the “Game Ended” event. For 1v1 matches, it is no longer possible to accidentally recover the game after one of the players has already been defeated. “Internet Cafe” has been added to the list of Group categories. Lobby countdown timers have been reduced from 10 seconds to 3 seconds for “Recover Game” and “Watch with Others” game lobbies. The order for “Most Recent” and “Highest Rank” in the “Sort by” dropdown menu on the Profile > Ladder > Career Summary page has been switched. The “Career” heading on the Profile Summary page has been renamed to “Statistics”, and “Total Career Games” has been renamed to “Games Played This Season” to more accurately reflect the data being displayed. A new “Show Game Start Countdown” option has been added to the Game Options window in the Map>Map Options menu. Enabling this option will display the 3-2-1 countdown timer that was added in Patch 2.0.4 for the Take Command and Recover Game features. This option is disabled by default. Fixed many text and sound localization issues throughout the game for all languages. Fixed many keyboard layout and hotkey issues across all languages. Fixed multiple crashes that could occur when utilizing the Take Command feature. Fixed an issue in which multiplayer replays could not be re-paused if a player left the game while it was paused. The Watch Replay Solo button is now properly disabled upon completing a game of StarCraft Master. Fixed an issue that affected the accuracy of APM calculation. Additional changes to APM calculations will be coming in a future patch. Cloud saves are now properly created when exiting completely out of the client from Wings of Liberty and Heart of the Swarm campaigns. Fixed a rare crash that could occur when launching a Challenge mission after playing an Arcade game with an unusual dependency configuration. Fixed a rare crash that could occur when closing StarCraft II. Fixed an issue in which the “Waiting for Players” dialog could occasionally appear on the loading screen and drop players from the game. The “Pauses Remaining” counter is now consistent with how many Pauses are available. Fixed a number of streaming failures that could occur when streaming and repairing certain game archives. Video subtitles use the locale found in the Text Language field rather than the Speech and Movie Language field in the Options > Language menu. Training Mode maps are now properly categorized in the Match History page as Versus AI games rather than 1v1. Stage 1 Training Mode Help Menu now properly states that Reapers can be trained from the Barracks. Fixed multiple issues which caused Reduced Violence mode to display red blood. Fixed an issue which caused text glow to display improperly. Fixed a number of outdated loading screen tips. Lighting now behaves consistently for the Razer Marauder keyboard, Spectre mouse, and Banshee headset. Fixed a rare crash that could occur with particles made using the StarCraft II Art Tools Beta. 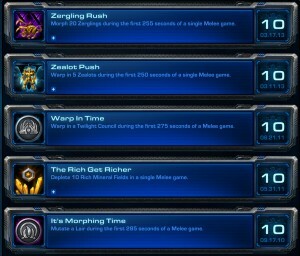 The following achievements no longer restart their tracking progress when playing across multiple missions: Smoking Corpses, Leaping Death, Get a Grip, Unchained, Shifted Priorities, Where the Wild Things Are, So Many Banelings!, Worker Rush, and Surprise!, FFA Gladiator, and Free-for-All Crusher. The Monster Smash achievement progress bar is no longer set to zero when loading a save or checkpoint. Fixed a graphical issue that could occur during the control room cutscene for the “Back in the Saddle” mission. Fixed a graphical issue that could occur when alt-tabbing out of StarCraft II from the Travel screen. Fixed a number of animation issues for Kerrigan and Raynor “Lab Rat” mission debriefing scene. Fixed a number of streaming failures that could occur when traveling to Skygeirr Station before the “Infested” mission. Fixed a number of icon image display issues on the Kerrigan upgrades screen. The correct campaign progress is now displayed on the Heart of the Swarm campaign select screen after beating the campaign and logging in from a different machine. Fixed and clarified multiple unfriendly strings, error messages, and text input bugs that could occur when performing various operations on Battle.net. Fixed many display and navigation issues that could occur when performing various operations on Battle.net. The “Watch with Others” and “Recover Game” features are now properly disabled for Offline Mode. Fixed an issue which occasionally caused players to enter a locked state if they were dropped from a match and selected “Watch Replay as Party”. Fixed an issue in which the Save Replay button appeared active but was non-functional after navigating back to the Score Screen from the Map Info page. Fixed a number of sound issues that could occur when repeatedly interacting with a replay timeline. Clan entries are now properly removed from the Groups list when a player is removed from a clan while in-game. The Create, Edit, and Delete buttons now display properly when navigating directly to a clan’s News tab. It is now possible to invite non-friends from the “Players Near You” list to a Group or Clan. Spam clicking the Leave Clan button no longer opens multiple confirmation windows. Fixed a display issue that could occur when banning and unbanning a player from a Group. A scrollbar is now created in the Edit Info window for a Group or Clan populated with enough text that scrolling is required. Maximized Group windows are now properly unmaximized upon double-clicking on the window header. The Groups list is now sorted alphabetically rather than by online member count. Fixed a rare crash that could occur when the maximum number of player slots were filled for certain Arcade games. Fixed an issue in which review text for Arcade games could become distorted. The review screen for Arcade games now properly displays character portraits rather than the default SC2 logo. Closing the Game Info screen for Arcade games can no longer cause closed chat windows to reopen. Fixed an issue in which the dropdown menu on the Profile > Ladder > Friends page always defaulted to 4v4 Arranged. Bonus pools no longer display negative values if the system clock is set to a time in the past. Chat window sizes are now preserved when closed and reopened. Fixed a display issue that could occur for players who are ranked in 15 or more teams. Fixed an issue in which creating an offline custom game occasionally caused players to enter a locked state. Fixed an issue that could cause dropdown menus to become disabled on the Custom Games, Browse, and Open Games tabs. Fixed an issue in which 3vAI placement matches could occasionally become stuck at 2 matches remaining. Active Live Event banners no longer cause the Kerrigan or Planets backgrounds to pop in and out when transitioning to and from the Home Page. Fixed an issue in which the Rewards screen could occasionally show incorrect information for the selected tab. The Social bar can no longer overlap UI buttons during the Credits. Players can no longer become stuck in an infinite loop when launching and quitting out of the Tutorial. Rank frames now display around non-friend character portraits. 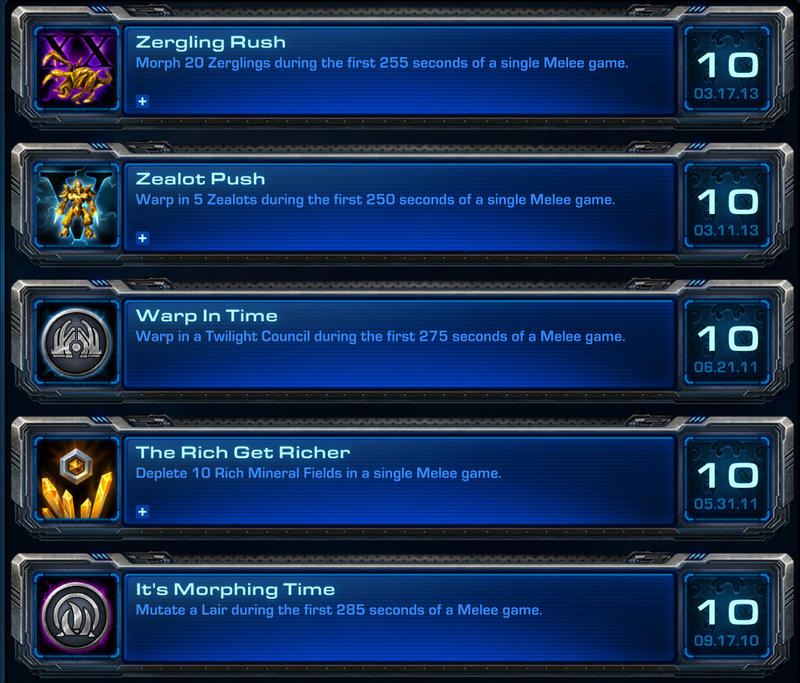 Frame rate performance has been improved when mousing over or scrolling through a populated Match History. Fixed a display issue in which Worker Status UI could cover town hall status bars in very high resolutions. Fixed a rare crash that could occur when attacking an AI base. It is no longer possible for SCVs to be left inside of a vespene geyser after canceling an under-construction Refinery. The Collector’s Edition Thor wireframe is now displays properly. The Void Ray’s Prismatic Alignment ability now plays a sound effect when activated. The Mothership’s Time Warp ability now plays a dissipation sound effect. Fixed an issue that caused uprooted Spine Crawlers to occasionally appear rooted. Creep Tumors being created from an existing Creep Tumor can no longer be attacked before they are visible. Zerg eggs no longer play extraneous sound effects when units hatch. Impact effects can no longer change location when units are turned quickly. The Oracle’s Pulsar Beam can no longer extend behind the Oracle when attacking large targets. Fixed a graphics crash that could occur in a variety of map loading scenarios. Fixed a rare graphics crash that could occur when playing certain Arcade games. Fixed many localization issues across all languages. Publishing a 1-player map with the “Hide Battle.net Lobby” option enabled no longer prevents users from playing that map in the Arcade. Fixed a rare crash that could occur when using the Undo/Redo operations while modifying water cells. Simultaneously modifying the cost of multiple units no longer causes a crash. Switching between Categories (such as Units or Combat) in a Behaviors (Buff type) Modification table now occurs more quickly. Macs using Nvidia GTX 680MX graphics cards now default to max resolution and Ultra graphic settings rather than low resolution and Medium graphic settings. Changing Language and Text settings in the Mac editor no longer causes a crash. 5. Done – with a few seconds to spare. Hope that helps and post in comments alternate strategies if you like! Global Play is now live. Players can now easily switch between regions via the new “Regions” button on the StarCraft II login screen. Your game language and user interface will not change when you change regions. Your character profiles and ladder data are unique to each region. When your region’s game servers are undergoing maintenance, you may be able to play in a different region that is not down for maintenance. For more information, please visit our Global Play FAQ on our support site. StarCraft II will no longer download upcoming patch data while the game is running. Fixed an issue where players would be unable to change their language if patch data was not 100% downloaded via the game launcher. Fixed several issues causing the game to turn unresponsive when pausing and leaving the game in various states. Fixed an issue that would cause the game to run low on video memory. Fixed a desync that could occur between Mac and PC if an AI was scouted with a cloaked unit. Fixed a crash that could occur in rare situations when force-quitting StarCraft II. Fixed a number of crashes that could occur when viewing and rewinding replays. Fixed an issue where players could not hear voice chat when using the FMod provider. The language selection dropdown should no longer display an incorrect language. Fixed a crash that could occur when playing some Arcade games when using a custom hotkey profile. Fixed a countdown display issue when utilizing the Take Command feature in the Korean and Taiwanese game clients. It is now possible to properly un-bookmark Arcade maps from outside of the Bookmark page. Fixed a number of issues related to the “only officers will be shown” warning text reserved for Groups with large rosters. Clans and Groups rosters are no longer sorted in reverse order. Clans and Groups are now defined properly in chat when typing in a game. Fixed a crash that could occur when creating a Clan or Group using certain combinations of special characters. Fixed a display issue that could occur when scrolling down a large Group roster list. It is now possible to use special characters in Clan and Group names. It is now possible to use spaces in the names of groups in the Russian game client. Fixed an issue for players in Korean or Taiwanese game clients who were unable to add Battle Tag friends in certain situations. Fixed a crash that could occur when double-clicking an .SC2Map file while the editor was downloading required dependencies. Are you an SC2 player? If you are let us know what you’re most looking forward to with the expansion. Wow – I knew Blizzard were doing some major overhauls of SC2 prior to Heart of the Swarm, but this patch brings some pretty huge changes indeed, particularly in regard to user interface. Read on for all the details, but if you own the game definitely log in, download the patch and see how much things have changed. StarCraft II: Wings of Liberty patch 2.0.4 is now live! This major patch brings a number of exciting new systems and improvements to Wings of Liberty while paving the way for the release of our Heart of the Swarm expansion on March 12. Please read the full patch notes below. The User Interface layout, art, and graphic style have been completely revamped. Players are now one click away from any major screen in the User Interface. Many redundant screens and game modes have been eliminated. Anyone can now create or join a Clan and participate in private clan chat, post news on Clan affairs, and more. Clan tags are pre-pended to character names of all players who join a Clan. Groups are for players who want to associate casually and in larger numbers. Joining a Group is a way for players to interact with others who share common interests. Players are allowed to join many different groups. Players who have used their free character name change will receive an additional one. Watch with Others: Players can now watch replays with others in the same game. Take Command: Players watching a replay together can also opt to “Take Command” of the replay and assume control of selected player armies. Recover Game: Players can now choose trecover from a game that may have ended prematurely due to disconnection, input loss, or other abnormal causes. Performance tab now tracks gameplay stats such as Average Unspent Resources, Time Supply Capped, Workers Created, and APM. New buttons allow players to “Play Again” or “Watch Replay Solo” directly from the post-game Score Screen. Race Report: Tracks number of games played and win/loss ratios for every race matchup. Map Report: Tracks number of games played and win/loss ratios on every ladder map. Player Profile now shows all wins and losses for all leagues. Players will soon have the freedom to select any game region to connect to and play. Global Play will be enabled in the coming weeks. Please see our Global Play FAQ. 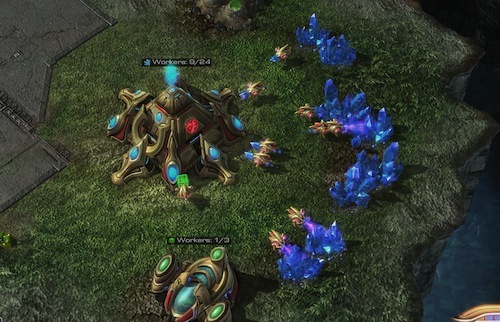 Players can now select among different languages in StarCraft II. Speech and Movie Language options added to the Options > Language menu. Text Language added to the Options > Language menu. Three options have been added to the Matchmaking Screen to help newer players make a more gradual transition from single-player to multiplayer. Training Mode allows players to work their way up from basic StarCraft gameplay skills to great challenges. Versus AI Mode is a reworking of the previous Coop Versus AI Mode in Wings of Liberty. Players can now utilize the matchmaking system to challenge an AI opponent that scales in difficulty. The new matchmaking AI can accommodate a wide variety of skill levels and play styles. 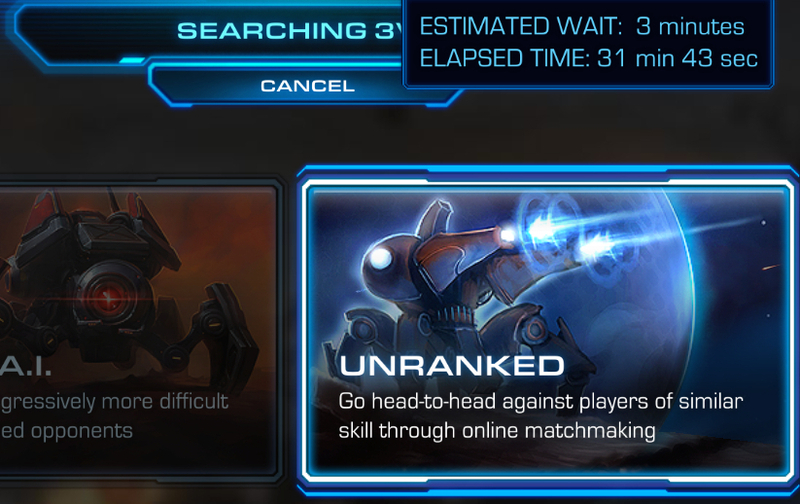 Unranked Play allows players to engage in matchmaking and find games vs. other players without the pressures of the ranking system. For more details on these new features, please see our Ways to Play video overview. The overall AI play experienced has been greatly enhanced. In a custom game, players can now elect for an AI player to follow a specific build order, such as Full Rush, Timing Attack, Straight to Air, and more. AI players will now report key information back to their player allies, such as when they are scouting, attacking, expanding, and retreating. Additional AI improvements, including the ability to issue specific commands to AI partners, will be coming in Heart of the Swarm. Players Near You identifies and displays other players on your local network, making it easier to locate, chat with, friend, and play together. This feature can be disabled in the Options > Social menu. No Build Order: Selecting this option in the Custom Game lobby hides the build order from being displayed in the Score Screen. No Match History: Selecting this option hides the game from the player’s Match History. New Enable Group Sounds option in the Options > Sound menu produces additional sounds for groups of units performing the same activity, such as Marine marches, mech ground-shaking, and more. The Help Section has been revised and updated. New waypoint and targeting confirmation icons have been added. The Menu and Help buttons are now located above the command card alongside the Social button. The Achievements and Message Log menus are now accessible via the Main Menu. New Select Army Units button is located next to the Idle Worker and Select all Warp Gates buttons. These buttons are now all consolidated together in the UI above the minimap. Decal art has been refreshed and now appears brighter and more visible in-game. New Victory Fanfare sequences now play when a players is victorious at the end of a game. Targeting: Shows friendly units when targeting a beneficial ability and enemy units when targeting a harmful ability. Damaged: Only show for units with less than their maximum life, energy, or shields. Display Team Colored Life Bar: Displays unit life bars using team color. Always Show Worker Status: Displays the current and ideal number of workers above harvestable vespene geysers and town halls. Enable Simple Command Card: Displays a more simplified view of the command card. Show Current Order Indicator: Displays an indicator on the terrain when units are issued a movement or attack command. Select All Larvae: Selecting a single larva will select all larvas attached to the same Hatchery. Enable Enemy Unit Selection: Allows the player to select units that can’t be controlled such as neutral and enemy units. The maximum numbers of players that can be in a party has been raised to 16. All maps that appear in the Custom Games section can now utilize the same Game Info pages (Overview, How to Play, Patch Notes, Reviews) that Arcade games received with Patch 1.5.0. New Copy Link buttons have been added, which automatically copy certain links tthe clipboard, allowing players to share them with others via clickable links in chat or on the web. When clicked, these links will navigate to the in-game page. Structures Tab (hotkey T): This panel shows the structures owned by each player. Upgrades Tab (hotkey G): This panel shows the upgrades researched by each player. Clicking on an icon in the Units/Structures/Production tabs will now center the camera on that unit. Continued clicks will cycle through all units of that type. Attacked units now flash white for observers. Nuclear Launch and Nydus Canals now create pings on the minimap for Observers viewing Everyone. Added a hotkey to flip sides that player names appear in the Observer UI when watching a Versus Mode 1v1 game. Brand new SC2Interface mod support has been added, which enables casters and observers to watch games of StarCraft II using a completely custom user interface. This gives production crews a new set of powerful tools to create even more epic broadcast experiences. For more information on how to use this feature, please see this thread in our User Interface forums. Players who have blocked communication with others are now also prohibited from initiating chat with those they have blocked. A new preload Info dialog has been added for defining game data, asset files, and banks to be preloaded in-game. This is accessible from the Map/Mod menus in all modules. Added color preferences for text preview display. The Arcade Info dialog has been renamed tBattle.net Info. This info is now available for non-arcade maps as well. Mods can now optionally be saved as SC2Interface files as long as they don’t have any data which affects gameplay. Mod gameplay/interface status can be checked using the Mod > Mod Status window. New Export Locales and Import Locales commands have been added. These are available under the Map/Mod > Locales sub-menu. These can be used to export and import localized text to and from text files. The Dependency dialog now includes a display of the full dependency chain resulting from the requested dependencies. Dependency reference checking and validation now accounts for the full chain properly in all cases. The Dependency dialog now issues a warning when Multi mods are used in conjunction with Story mods. These are designed to be mutually exclusive and could cause a variety of problems in game when combined. Added toolbar button size preference. A new Attack Wave Graphs window is now available from the Data menu, for visualizing attack wave cost/supplies vs. time. Added Cutscene Frames. Cutscene frames are dialog items you can play a cutscene in. Right-Aligned: Animations can now specify that they always end at the end of the block. Weight: The blend value for this animation block. Reverb: The reverb to set while playing back the cutscene. Auto Destroy on End: When disabled, the cutscene will not be destroyed when it ends, but instead it will pause on the final frame. Non-Seeking: If enabled, causes the sound to not change its current time when the current time jumps. Speaker Mix: You can now set and animate the speaker mix values. Priority: Allows you to specify the priority level of a fade when multiple scenes attempt to control fade. Terrain is now automatically imported when starting the Cutscene Module. Active Light Nodes will now search for a light suffixed with “_Low” if graphics options are set to Medium or Low. New icons added for all node types! Added a new “Time Follows Edits” mode under the edit menu that causes the timeline cursor to always follow the edited block. Added Sound Group Nodes: These folder-like nodes allow you to add sound nodes to them then set properties for all sounds inside the group at once. Volume and pitch properties are now treated as multipliers instead of absolute values. Setting sound index t-1 now causes it to pick a new variation each time it plays. Sounds now properly fade out after their blocks end. Sounds can now specify Active Shots. Value changes that represent less than 0.1% of a difference no longer create new keys in auto key mode. You can now add multiple cutscene filters when playing back a cutscene. Cutscenes are now played back in Replays. Added the Data Navigator Window. This new window visualizes how objects are linked to one another. Each tab in the Data Module now remembers its own view mode. Model Preview Panes now animate with the model’s default animation, making effects easier to identify. Added a new Select in Palette command. Added F2 support for renaming objects. “Show Advanced Values” is now “Show Basic Field Labels”. Instead of hiding advanced fields, it adds “(Basic)” to the name of basic fields and sorts them to the top. Fixed size arrays are now edited as one control for each array entry rather than using a list-based UI. “Show Default Values” is now “Sort Fields By Source”. Instead of hiding default values, it will sort values in the order: Active Document, User Mod, Blizzard Mod, Core Mod. Added field hint tooltips to dropdowns for enum type fields. Structure sub-fields now properly display composite field hint tooltips. Many new field hints added for Abilities, Actors, Effects, and Units. Added a new Jump To Instances command in the context menu for jumping from function definition to corresponding calls. Added a new Show Global Links Only option in the View menu for seeing global trigger elements directly in the Used By links. A new Diamond region shape has been added. A new Diagonal Selection option has been added in the Tools menu for selecting objects and terrain along the diagonal grid. A new View option has been added for displaying normal/upgraded creep, under View > Show Terrain > Show Creep Upgraded. Units marked as Initially Hidden will use an alpha fade effect in the editor display. Palette existing objects lists now include a Group filter and column, and context menus for Add To Group and Remove From Group. The Water palette now includes a Height slider for adjusting the height of the current water template. No Fly Zones now have three color states: Normal (no overlap), Overlap (hard radii overlap), and Warning (only soft radii overlap). For best pathing performance, avoid the Warning state. Foliage density maximum reduced to 2.0 per cell. Anything larger than this significantly impacts game performance. Added “Force Occlusion Hide” to placed doodads, which forces doodads to be transparent if units are behind it. Added a Preview button for previewing sounds directly from parameter dialog. A View History Navigation option, including Back and Forward commands, is now available from View > History sub-menu. A new Explorer view has been added for seeing global elements referenced by the currently selected element, available under View > Show Explorer. A new Smart group display has been added, which opens a second group only when an element is explicitly viewed via double-click or View Selection command. This is toggled under View > Show Groups. Libraries defined in the active document are now shown in the Triggers list rather than the Libraries list. The Libraries list will only contain read-only dependency libraries. Elements can now be dragged and dropped from one library to another. This will include updating all usage of those elements in the active document. A new view option has been added for setting default input focus on search fields vs. lists, available under View > View Options > Default focus On Search Fields. Fixed a crash that would occur when StarCraft II is run with low disk space. Fixed an error that occasionally occurred when queuing for a match if a disconnection occurred in the previous game. It is no longer possible to build Creep Tumors on top of lowered Supply Depots. Fixed an issue preventing Zerglings, Roaches, and Ultralisks from autocasting Unburrow when an enemy Colossus was near. Fixed an issue where Hallucinated units would not play Hallucination death animations when playing in Reduced Violence mode. It is no longer possible for duplicate versions of the same Arcade game to display in the Top Rated dropdown filter. Fixed a display issue with the scroll bar on the Replays page. Fixed a display issue that could occur when viewing Patch Notes for an Arcade game. Arcade games played through Fun or Not now appear properly in the Match History and Recently Played lists. Clicking Create Game in the Single-player Vs. AI menu while a map is downloading no longer causes the game t enter a state where it is unable to launch any maps. Fixed an issue causing a player’s online status tbe set to Available when it was changed from Away to Busy. Fixed issues with some displays that could occur when viewing Arcade Game Info pages while queuing up for matchmaking games. Fixed an issue causing the race selection buttons on 3vAI queues to occasionally change to names of colors. Automatic backups for documents saved as component lists will now properly save multiple backup files. Tutorial game variant will not be changed when other variants are added or removed. Fixed various issues with downloading dependency data from Battle.net when opening a document. Fixed issues with team settings in variants for maps with a large number of players. Fixed an issue where the editor could crash if the user’s build was not completely downloaded. Fixed several issues related to Undo/Redo. Fixed several issues related to element linking. You can now place or move objects at height zero if there is no terrain visible. Actors with conversation nodes will now animate when not in view, allowing dialog to play at the correct time. Active Light elements no longer change the light one frame late. You can now chain together bookmark jumps. You can no longer use non-Ascii characters in Cutscene Names or Bookmark Names. You can no longer rename the (Previewer) scene. Scenes with very large linking webs should now load much faster. Fixed a bug where models would sometimes continue to draw when switching cutscenes. Editing curve values should now preserve custom curve tangents. Previewing from other modules will now set the Cutscene Module back to the (Previewer) scene. Painted pathing visibility is now properly tied to visibility of the Pathing layer. Distance measurement now accounts for ramps properly. Eliminated excessive delays when modifying functions which are heavily used in the document. Comments can now be moved/pasted into switch cases. Ability Commands using Any or All sub-types will now show all possible parameter values. Unit trigger events now properly handle using a unit array element for the unit parameter. Last Created functions now return an empty value if the last creation failed, rather than the result of the previous creation. Invalid effect ids will no longer be treated as “any effect” in events. Data conversations with choices will now run properly in game, as long as cinematic mode is enabled. Fixed an out of memory crash that could occur when adding a region to itself using triggers. It is now possible to copy triggers across libraries inside the same mod. Ability and Weapon Arc data values now accept 360 as values. Targeting arrow reticules now display properly when shaders are set to low. Fixed an issue with “Disable OS Keyboard Shortcuts” and the mouse cursor. Fixed an issue with resolution options being limited on Thunderbolt displays. Points in the Curve Editor can now properly be deleted. Placing keys in the Curve Editor are now being created correctly. Text labels are no longer clipped in the Curve Editor. Fixed an issue involving Vertices and Primitives on the status bar. Fixed a crash that could occasionally occur when attempting to publish a map. Fixed an issue involving setting up multi-dimensional arrays in the Trigger Module. The mouse cursor is now visible in the viewpoint windows. Fixed an issue with the status bar overlapping text when using the Regions or Cameras layer in the Terrain Module. CMD + Tilde will now switch between multiple editor windows. You can tell it’s getting close to a Blizzard game launch, as the videos start coming in thick and fast. In this case it’s StarCraft II: Heart Of The Swarm, and the latest release is a 6-minute plus overview of the changes to the types of gameplay on offer in the expansion. 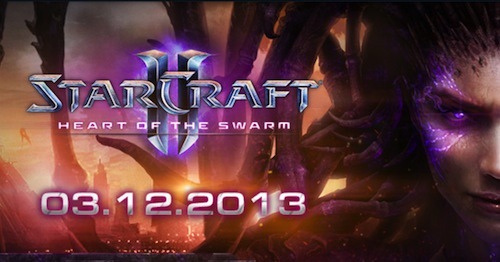 We’d love to hear your thoughts on the changes coming with Heart Of The Swarm, so sound off in comments. Also don’t forget there’s a local launch event for HOTS. To coincide with the 12th March launch of SC2’s first expansion, Heart of the Swarm, Blizzard Entertainment have announced a local launch event. The Swarm’s global invasion begins in Australia! Join the Zerg rush to Federation Square in the heart of the city of Melbourne, Victoria. From 8 PM AEDT on Monday, March 11, you can be part of the excitement in person or via the live stream! So there you have it: will you be going? If you are and would like to snap some pics or cover the event more fully, drop us a line. You can check out the official launch website here. Oceanic Soap Box: What’s Got You Excited? Here’s where you come in: what games have you excited for this year? For me Heart of the Swarm is one, Marvel Heroes another and the upcoming Sim City release has me drooling as well. What about you?